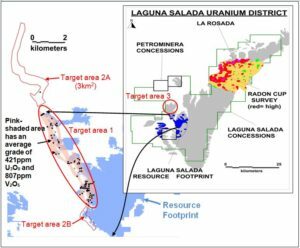 Toronto, Ontario – February 7, 2017 – U3O8 Corp. (TSX: UWE), (OTCQB: UWEFF) (“U3O8 Corp.” or the “Company”) announces that, building on the recent discovery of higher-grade uranium-vanadium mineralization at La Rosada, similar channels have been delineated in, and beneath, the lowermost gravel layer at Laguna Salada. These levels are in addition to the layer of mineralization on which the resource estimate was based and may represent significant resource growth potential at Laguna Salada. Table 1. Summary assay results from composite panel samples from trenches at the base of the unconsolidated gravel, sand and silt layers at Laguna Salada. The extent to which Laguna Salada gravel can be beneficiated, as per Preliminary Economic Assessment (PEA) is also shown for reference. May 20, 2011 technical report: “Laguna Salada Project, Chubut Province, Argentina, NI 43-101 Technical Report on Laguna Salada: Initial Resource Estimate”. Figure 1. Map showing the location of the gravel plain that contains the Laguna Salada resource (footprint shown in blue), the La Rosada exploration area, and the area that has been covered with a radon cup survey. The target areas for additional higher-grade channels in the lower part of the gravel are shown in red. Uranium-Vanadium at Laguna Salada constitutes a “caliche” deposit – where uranium and vanadium precipitated as a result of intense evaporation in a semi-desert environment. Mineralization is concentrated in a layer that is parallel to the surface from which evaporation occurred. Over 90% of the trenches that were used to estimate the resource at Laguna Salada are from a layer of mineralization that is parallel to the surface at shallow depth – constituting typical caliche-style mineralization in the gravel plain. Trenches excavated at the edge of the plain, where the upper part of the gravel has been removed by erosion, exposed higher-grade mineralization at the base of the gravel. This was considered to be part of the layer of caliche mineralization that simply draped the topography from which evaporation occurred – and was modelled as a single layer in the initial resource estimate at Laguna Salada. 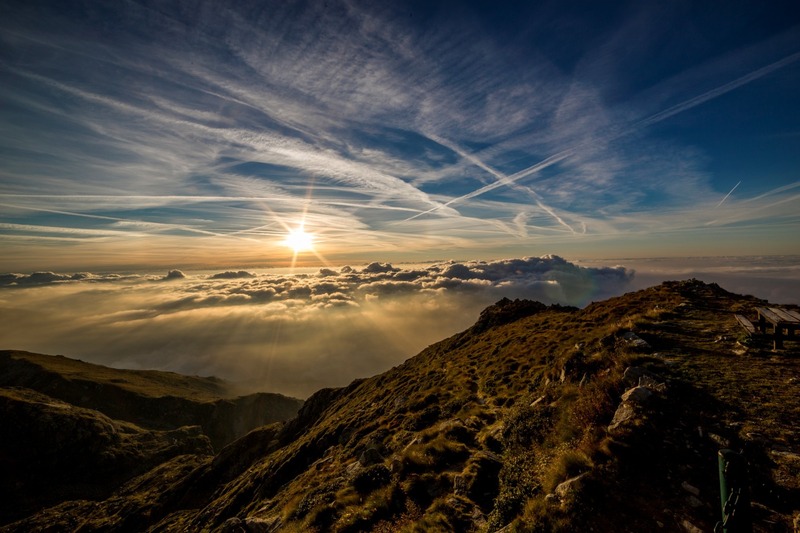 Underlying either unconsolidated gravel or sand is a fine-grained silty unit, the mineralized component of which has an average grade of 408ppm U3O8 and 0.15% (1,531ppm) V2O5 over a true thickness of 0.7 metres. The beneficiation characteristics of the silty layer, which may be weathered volcanic rock similar to that observed at La Rosada, are unknown at this time and will be tested in due course. There is a possibility that each of these three layers represents a zone of mineralization in its own right that is separate and distinct from the true “caliche” mineralization located in the upper part of the gravel on which the resource estimate is based. 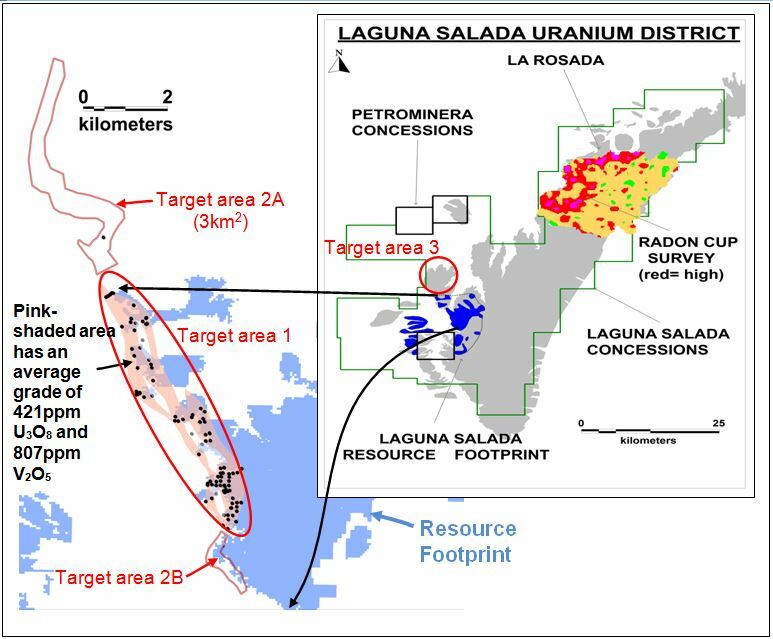 Target 3: It is suspected that the elongate zone of high-grade uranium-vanadium defined on the western margin of the current resource area at Laguna Salada lies in a gravel-filled channel. If this proves to be the case, other sub-parallel channels are likely to be located at the base of the gravel plain. The base of the gravel lies at a depth of 8 metres beneath the surface of the mesa-like plain and would require drilling with the Company’s vibrosonic rig. The main targets for additional higher-grade channels at the base of the gravel lie beneath the current resource area as well as beneath the gravel pain that lies immediately north of the resource area. Channel samples were taken on the walls of each trench, bagged and delivered to the ALS Chemex’ preparation facility in Mendoza, Argentina. Each sample was riffle-split. One sub-sample was jaw-crushed to <2mm and then riffle-split again and a 250 gram sub-sample pulverized to 75µm for shipment to ALS Peru for assay by ICP (method ICP-MEMS61) after four-acid digestion.